Around the ranch, Dexter the Dog known as a “basset bull”. Short and mighty, Dexter is the unconventional progeny of a basset hound and a pit bull. 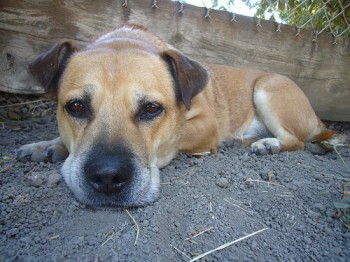 Dexter rescued himself by wandering on to the Harvest Home property during May 2008. Most likely, he was dumped in the nearby farm fields. In the weeks following his “rescue”, we made attempts to find an adopter for the short dog. But, Dexter already made his own residential selection. So, we honored his decision. Dexter’s arrival was an inspiring story. He found sanctuary from starvation, wild animal encounters and dangerous roadways. Dexter simply is his own hero.